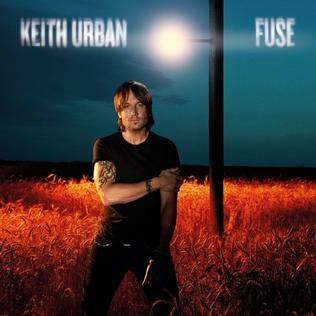 If Keith Urban’s idea of breaking out of the box is recording a country pop album that sounds like a carbon copy of many of his Music Row contemporaries, then he was triumphant in fulfilling his goal on Fuse. Acutely mottled with lyrical clichés and bloated, over-cooked production provided by a plethora of producers, Urban’s seventh studio album is all flash with very little substance. Fuse sounds fairly impressive upon initial listening, but when peeling back its glossy layers you realize it’s merely a labyrinth of country pop fluff. Midway through you begin to notice Urban’s introspective lyrics and scorching guitar solos are conspicuously MIA. Duets with Miranda Lambert (“We Were Us”) and Eric Church (“Raise ‘Em Up”) are both keepers and are the closest hints of Urban at his best here, but unfortunately they get lost in the midst of a track list that’s littered with too much mind numbing filler. The nonsensical throwaways “She’s My 11” and “Red Camaro” are easily Urban’s most pedestrian tunes to date. Although not particularly known for being a ground-breaking artist, Urban recently confessed that he “just wanted to see how far I could go before it’s not me,” but in his effort to redefine himself, he seems to have concurrently lost sight of his own identity while becoming a victim of his various co-producers’ sway. Fuse is so over produced with studio gimmicks it would make even Mutt Lange blush. Urban’s latest might be great for keeping your eyes open on a long road trip, but it ultimately ends up sounding like nothing more than a desperate attempt to stay relevant with trendy bro-country. Chris Martin and crew offer up an ethereal sliver of grandness for the next installment of The Hunger Games: Catching Fire. Equally cinematic and surreal, “Atlas” is a slow building hymn, which harkens back to Coldplay’s early days and is the perfect anthem to jumpstart an early fall season of numerous new music releases.